I’m not a girlie-girl. But, I do have some tendencies. I like things neat and orderly. I like flowers and plants wherever they can fit or hang and cascade beautifully in a corner. I like fuzzy area rugs on my floor and throws across my couches and the corners of my bed. I adore unique picture frames and antiques mixed with industrial-looking décor. And, recently, I’ve become an admirer of bold entry doors. Recently, I joined the “burgundy door” club. – A good gut feeling. Don’t work with someone who makes you uneasy. Ever. – A company with extensive time in the industry (it’s hard for bad companies to stay around long). – Good reviews online. Get on Google and see what strangers are saying about them. – Responses to poor reviews. You can learn a lot about a company in how they respond and correct issues with unhappy customers. Most installation companies do not manufacture their own products (some do, yes). This is where I learned a lot during the replacement entry door process. Not all doors are created equal. I learned that Brock is very selective with the manufacturers they choose to work with. Brock chooses manufacturers with very high durability, appearance, and energy efficiency standards—our entry doors are meant to last for many years. So, they should be adding to our home’s effectiveness and value. When shopping for an entry door in Toronto, ON—and in life, in general—it’s too important to be mindful of your limitations. Home improvement projects can be exciting and get out of control, quickly. I’ve lehttps://www.brockwindows.com/replacement-windows-doors-toronto-ontario/arned from experience. Oops. Do a bit of research on entry door prices, compare, and decide on a good cost range you feel comfortable with. And stick to it. You don’t have to be girlie to want a burgundy door. But, you do need to be smart about your decision-making before you choose an installation company to handle your next project. 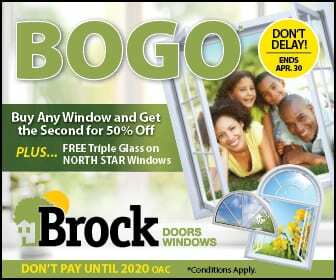 Give the team at Brock Doors and Windows a try. I’m so happy I did!